Chris Townsend Outdoors: A midge net with built-in glasses! The midges are almost upon us. June is the month when they start to become a real problem in the Scottish Highlands. Head nets are one way to deal with them but I've never liked them. However I am impressed with the latest headnet design, called Netspex. I haven't needed to use it in anger yet, though I'm sure I will soon. In the meantime I've described it and given my thoughts on the TGO website here. Don't go into your local bank with that on Chris. Wasn't impressed as the glasses constantly steamed up due to lack of a breeze which as we all know that is when the midges are out in force. Also that the net etc was made up from a Highlander midge net and some cheap safety glasses off Ebay so lets put it this way you could make your own for half the price. I haven't had them steam up much, unlike the midge nets with plastic screens, though it has happened a little at times. Certainly you could make your own but that's true with lots of gear. 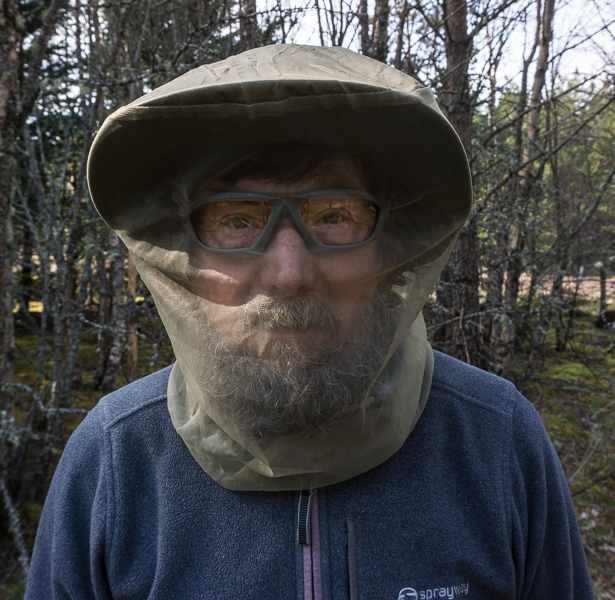 The other problem i came across with this design was that because the glasses are close to your face then it holds the midge net itself close to your face and the net gets wet with your perspiration which the midges are attracted to then the midges settle on the outside of mesh close to your skin and bite through the net. I haven't been bitten through the net - I think because I've mostly worn the net with a hat and even though the glasses do pull the net in close to the skin it doesn't touch. I'll be using it again this summer - if I have any problems I'll say so.